Are you aware of the tangible benefits derived from our support of the FreeBSD community? In conjunction with our year-end fundraising drive we are going to be spotlighting different people on our website, blog, and Facebook page who have received funding to work on development projects, run conferences, travel to conferences, and advocate for FreeBSD. Please enjoy our first installment of our Faces of FreeBSD series! Let us introduce you to Alberto Mijares. 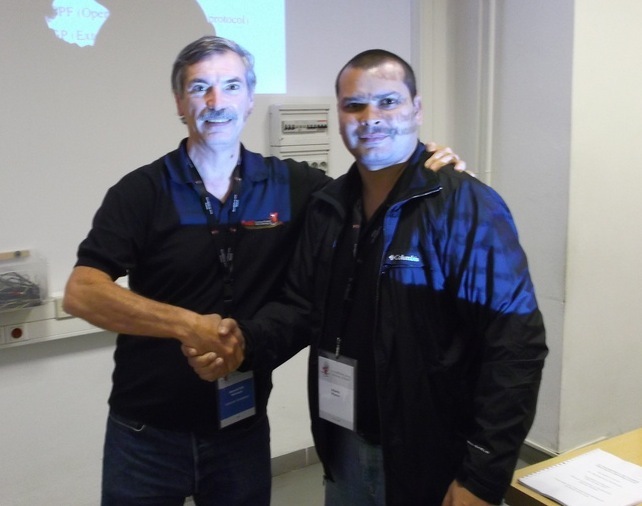 We helped him attend EuroBSDCon 2012 by assisting him with his travel expenses. Here’s his story. My name is Alberto Mijares, I am 33 years old, and was born in Caracas, Venezuela. I started learning about computers in a special program starting in fourth grade on 486 PC’s. By the time I got my bachelor’s degree I had learned programming languages, spreadsheets, word processors, and educational programs (LOGO, dBase, GWBasic, Pascal, and Turbo Pascal) on “cutting edge” Pentium MMX’s. In the late nineties I studied petroleum engineering at Universidad Central de Venezuela. Later I began work at a telecom company, was introduced to UNIX, and ended up on the technology support team, responsible for monitoring the company’s IT infrastructure, composed of three IBM RS-6000 servers with AIX for the core business, a couple of NT and W2K servers for domain controlled and call center software, and ten servers with FreeBSD for web, mail, dns, proxy, dhcp, database, sms gateway, ivr, monitoring, file sharing, and other services. Once I learned about FreeBSD I quickly became a fan of UNIX and wanted to know more. I took Linux-based courses and could compare Linux and FreeBSD. I transferred all my new knowledge to a FreeBSD environment and learned about both operating systems inspired by the same philosophy, in parallel. In my country, public administration promoted the use of free software, which influenced the growth of development companies, training institutes, nonprofit user groups, and a philosophical-activist movement. But Linux was also mainstream because of its popularity. I continued to work with Linux but technical issues and disappointment led me to ask my superiors to migrate the platform to a more robust operating system—FreeBSD. They still thank me for it. I’ve been an advocate to use, promote, learn more, and improve FreeBSD. I work to consolidate a group of users, support the use of FreeBSD in infrastructure projects and encourage public and private companies to help fund The FreeBSD Project. Three years ago I was able to collaborate with Hans Peter Selasky to support a new device in the u3g driver. This year, thanks to a travel grant from The FreeBSD Foundation, I was able to meet Hans at EuroBSDcon 2012 in Warsaw and talk with him on many topics. I also was able to meet Paul Schenkeveld, Kirk McKusick, Eric Allman, Peter Hansteen, Chris Buechler, Chris Moore, and many other personalities in the BSD world. The FreeBSD Foundation paid for my accommodations and conference fees, and I’m very grateful for that subsidy. The conference motivated me so much that I organized a meeting with my peers to share the experiences. In November I gave a talk about IPv6 and FreeBSD to local university students. I plan to attend BSDCan next year, take the BSD certification exam, and organize a big BSD event in my country for late 2013 or early 2014. I would like to be a facilitator of the BSD Certification exam in my country. I just submitted a PR with a new port for the FreeBSD Ports Collection. Soon I will be helping to translate the updated handbook to Spanish. FreeBSD has become a lifestyle for me. I want to be more involved with the project as time passes.